So we’re two weeks into the new season and already you’ll know if you’ve had a good start or not. Aguero: did you have him or didn’t you? That’s the question and it will dictate whether or not you had a good week or a poor one. I didn’t: dropped one million places nationally and have plummeted in the mini leagues. If you did have him then you’re off to a flyer. Indeed all of the Top 10 in our mini league hold Aguero. 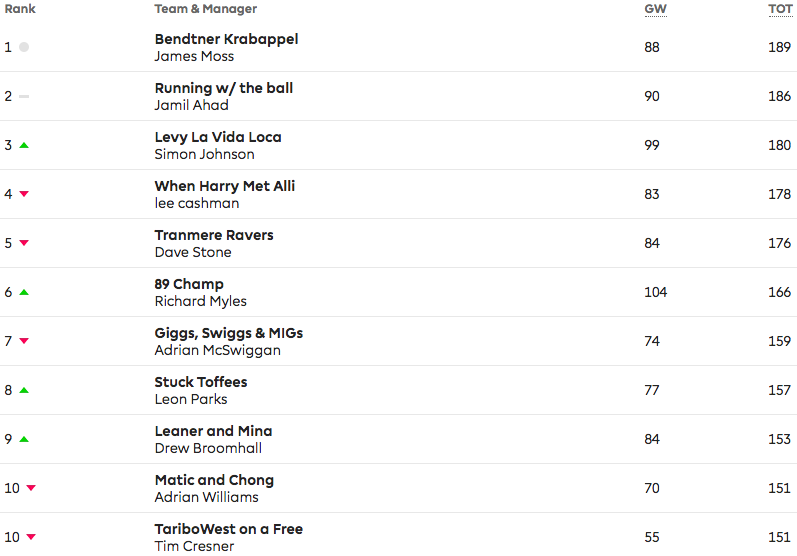 Richard Myles of Flume captained Aguero and holds Alonso amongst others. He racked up over 100 points. Good work Rich. There’s only two week’s worth of data so far but it looks like it could be the year of the wing backs. Alonso, Mendy, Robertson and TAA, Walker will come back into too and what about PVA and the very well priced Wan-Bissaka? Personally, I’m thinking of going five at the back. Attacking returns coupled with defensive ones. For those of us who didn’t have Aguero, it already feels like we’re miles behind and playing catch up. For those who do hold him then you’re entitled to feel somewhat smug. It’s tricky though because Aguero could be rotated, as before, with Jesus for the away games. Do you keep him if that keeps happening? What if Kane starts hitting hatties? Do you switch? You can’t have them both. James Moss of Manning Gottlieb OMD is currently top of the tree with 189 points placing him 15,000 globally. His team is pretty much template so he’ll not be knocked out of the top placings any time soon. That said, his bench looks pretty week. James – you were most unfortunate to get Wan-Bissaka off the bench!